We Have an Afternoon at the Lake | Sprezzatura, Y'all! Today is a beautiful late summer day – nice breeze, not too hot, a little crispness in the air. 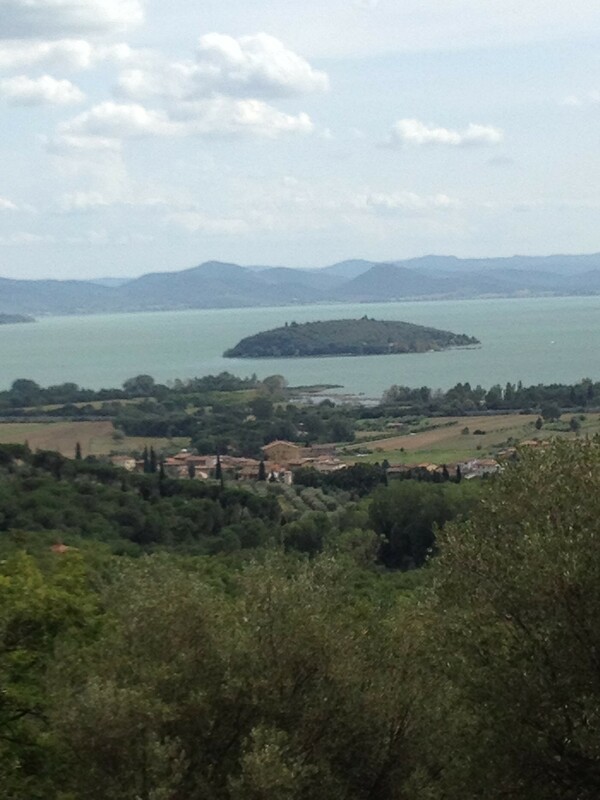 We decided to go somewhere fun and different today and settled on driving over to Lake Trasimeno. It’s about an hour away and it’s an incredible drive. We took the E45, the main highway that runs through Umbria, to Umbertide (this is pronounced um-BER-te-di – I mispronounced it for years!) and then took the little scenic road over to the lake. You snake through a few little towns until you get very close to the lake, then you have to go over a mountain. As you’re coming down the other side, you see these amazing views of the lake. You just can’t capture this with a camera, at least not with my smart phone camera. We got to Passignano just in time for lunch. 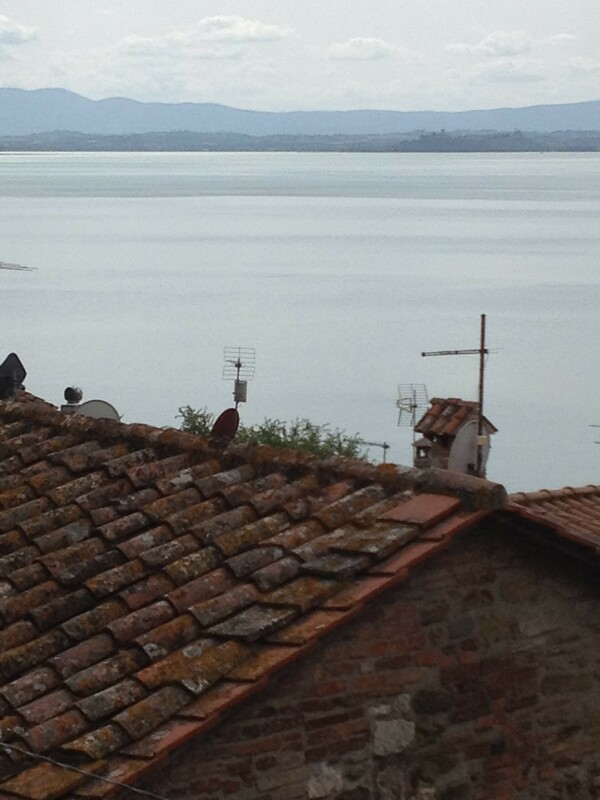 There are several towns ringing the lake and Passignano was the closet one to where we came in. It’s a charming little town right on the lake with a very nice walkway along most of the shore. All the restaurants on the lake shore looked very touristy and a little pricey. What the heck – we picked one and sat in their “garden” which was the back alley of the restaurant. It was actually pretty cute. We weren’t expecting much at all from the food and I was already starting to whine about the prospect of having a bad meal in a country made of good meals. With a finite number of eating opportunities I hated to waste even one. But it was quite good. We shared some “fried small lake fish” which were the cutest things I’ve ever seen. And very tasty. We shared some bruschetta with lake fish spreads (again, not sure exactly what kind of fishes, but very good). We also had ravioli with white fish (from the lake) and fried lake perch. Yum. The fried fish was perfectly done – not at all greasy or heavy – very light and so fresh. It was a very delightful meal with a perfectly crisp white wine and it wasn’t wasted, not even one bit. I stopped whining. After lunch we walked up the hill to the old part of town, called the centro storico (the historic center). As with so many Italian towns, the higher up you go, the older it gets. Passignano is a beautiful place with an old medieval stone castle at the top (it was closed so we couldn’t go in) and many, many twists and turns and lovely little gardens. 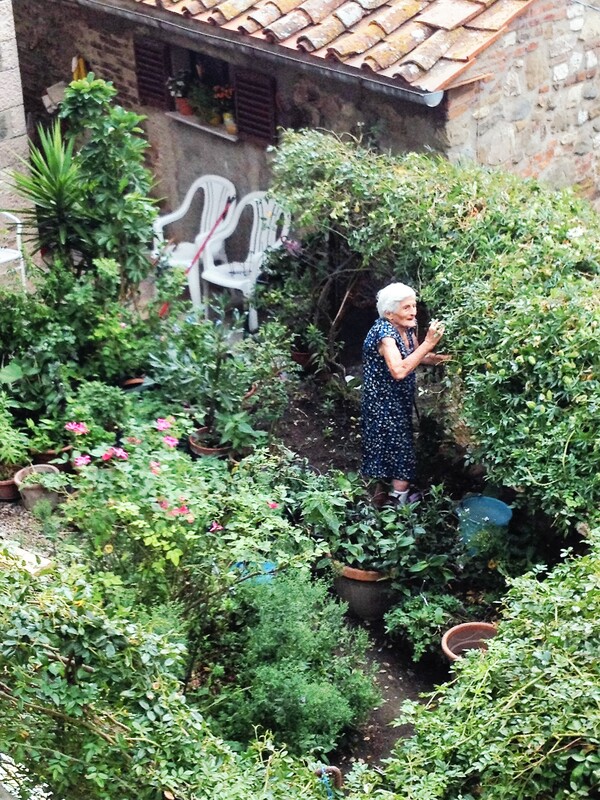 As we passed up and came to a piazza that offered incredible views of the lake, there was a older woman out tending to her garden. I was taking pictures of the view and caught her while I was at it. She saw me and was delighted that we were there and taking pictures and I think she was even proud that I took her photo. She talked to us in Italian for a little while and we said grazie and nodded our heads but didn’t really get what she was saying. Most people are so incredibly nice here. They love it when you take an interest in what they’re doing. Pay them a compliment and you have a friend for life. And that is really the best way to experience new places and things – jump in and meet the locals, pay attention to them. After all, you’re in their country and they are fountains of information. You can learn more from them than you can from any guide book. Learn a few words of their language and let human nature take its course. People love to share things when you take an interest in what they’re doing. 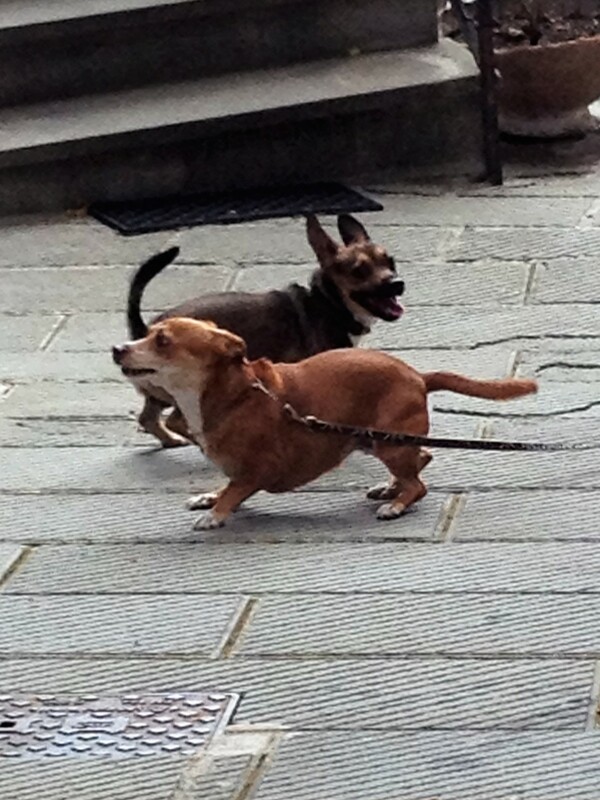 Millie the dog had a great time in Passignano, too. Just as we left the restaurant and started up the hill, we passed a house and a little dog came running out. He was exactly Millie’s size and they got along like a house on fire. 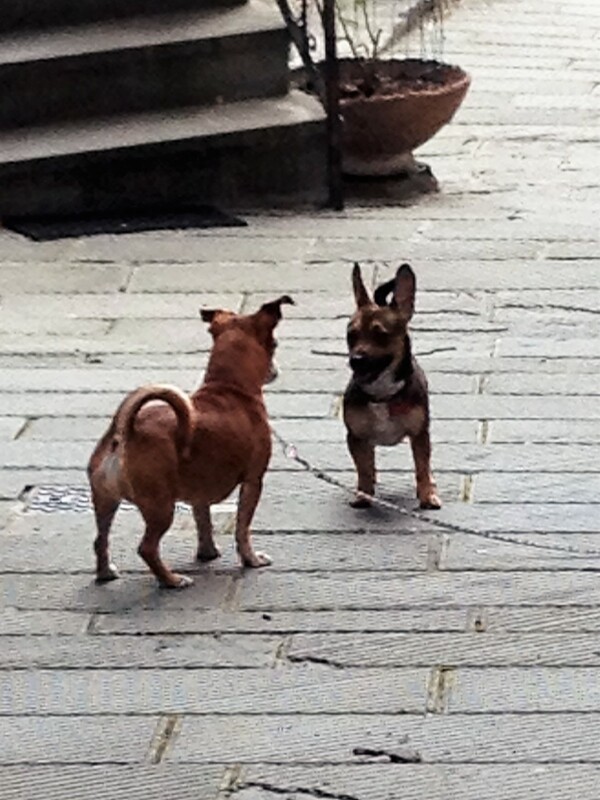 This little guy followed us everywhere we went, playing with Millie all along the way. As we made our way back down toward our car, this dog was right alongside. Everyone in town knew him – Balo – and as we passed by shops and restaurants everyone called out to him. I was very worried about him making his way back home, but my husband assured me that he wandered all over town every day and would be fine. When we got to our car, he was right along with us. Millie jumped in like usual and he contemplated it, but decided against it. We carry a little cup and a bottle of water in the car for her and I gave her some and he had a little and then he marched off down to the harbor. We all declared it a fun day and made our way back to the apartment in Anghiari. Cathy, so funny! I can hear you…….. love this! great shots! Timo’s mouth is watering for those cute little fish! Sounds like a nice day was had by all! They were worthy of mouth watering. It was a great day! Millie is probably barking in Italian now. Si. She is staying with Anna next week when we go to the Cinque Terre with some friends who are visiting. She’ll be fluent by the time we get back!